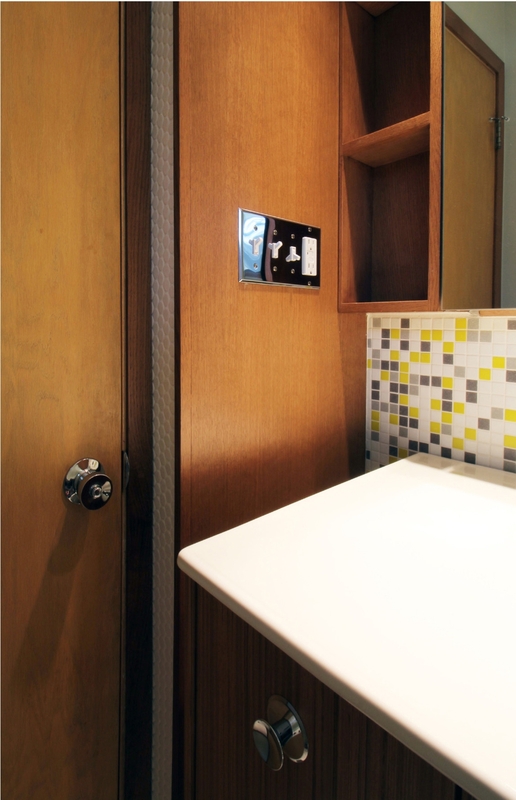 The 1950’s was rich with design innovation, but bathrooms and closets were still considered service spaces. 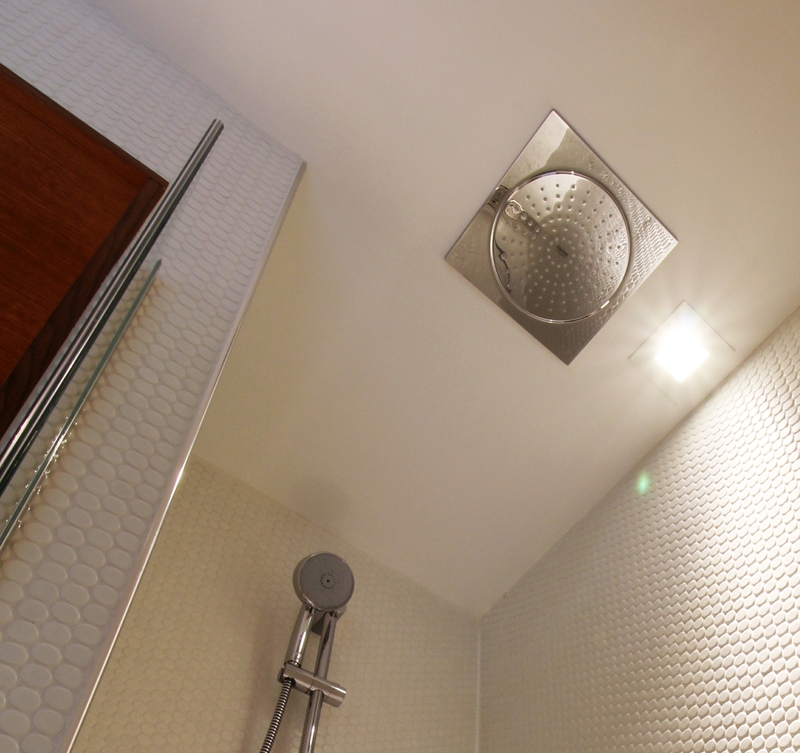 In this particular home, the owners came to us with the design challenge to update the original bathrooms and master closet with modern amenities, increased storage, and a more user friendly experience . In addressing the mid-century design, our intent was never to replicate a mid-century space, instead we sought to draw from the valid design intentions of the time: careful details, warm wood tones, thoughtfully accentuated colors and textures, and a clear definition of formal design elements. 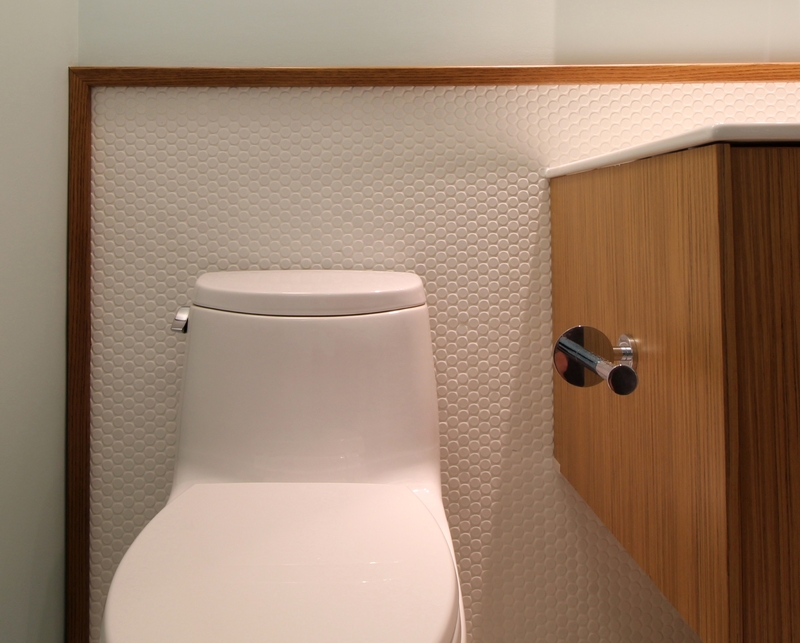 Our solution to the program was to visually enlarge the spaces by introducing formal millwork and tile elements within the boundaries of the existing bathrooms. In the master bath, the effect of the layered floating vanity, medicine cabinets, shelf unit, millwork soffit, and penny tile mass, blurs the boundary of the interior wall. To maximize storage, we introduced several solutions. The owner dreamed of a walk-in closet, but given the footprint we had to work with, that was not an option without significantly reducing the size of the bathrooms. We came to the realization that most of the floor area of a walk-in closet is merely a place to stand as you look through your clothes. In a five-foot deep, 30sf walk-in closet, we would have the same linear feet of clothes storage as a six-foot wide, 12sf closet. Our solution was to use the bedroom area as the closet circulation and dressing space, by introducing a six-foot wide, double pocket door. In the bathrooms, we introduced storage solutions through the vanities, each with four drawers, and more importantly through large mirrored medicine cabinets. 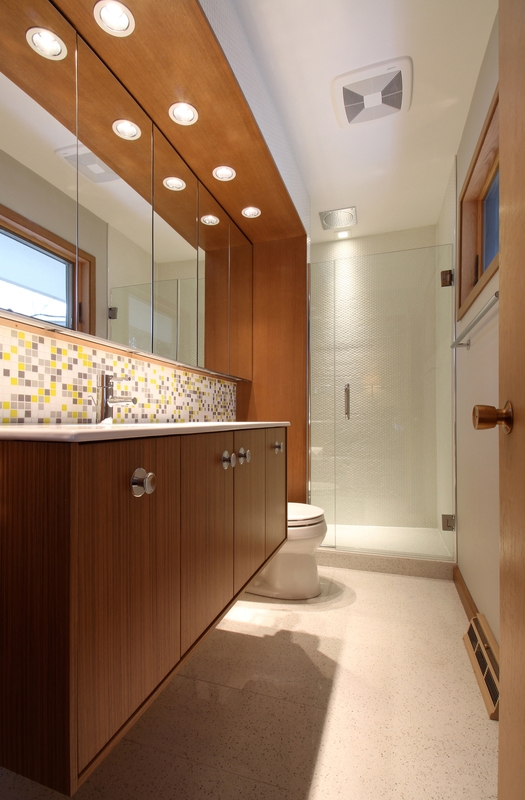 In the master bathroom we designed five 36” tall medicine cabinets integrated into the millwork soffit and surround. These were all stock units so we designed a small vertical shelving unit at the end to absorb construction tolerances and free our design from the limits of stock sizes. In addition to solving the architectural design, Liv Companies, as a design-build company, was also the general contractor. Our design + build approach extended great efficiencies into the project, and as a result the owners received both quality design and construction, in a project that would otherwise be cost-prohibitive for them to build to this level of detail.